Some people say that LinkedIn is just a job board dressed up in a social media dress. I tend to disagree. In the same time, if you don’t know how to use LinkedIn, I completely understand your frustration. LinkedIn for you really might be just another job board. The fact that some people use it “better” than you, will mean that your applicants response will be lower than on any other good job board. Candidates simply rarely apply for jobs on LinkedIn. They do all other things, but Apply for the jobs advertised. The first thing stopping you to hire on LinkedIn is your small reach. With up to 500 contacts, you are scraping the barrel really. You might as well just leave LinkedIn alone. Depending on the size of your market or your niche, to recruit in LinkedIn you really need to have access to thousands of people. Candidates AND clients. LinkedIn Premium is a great product for a recruiter. In most cases you will need the “Full Network Visibility”, so the Talent Finder and Talent Pro are the versions you should consider. The Only difference is the double number of inmails you can send at a time. There are also a number of advocates of using LinkedIn for recruitment without any subscription. I have seen that working, but realistically for a very small number of people. Why? It requires investment in time that a very few recruiters have. Building a network of thousands of very, very targeted contacts is hard and time consuming. Here is a live example that shows you power of your LinkedIn network and reach. 1342 views are from the 2nd connections – people my connections are connected with. 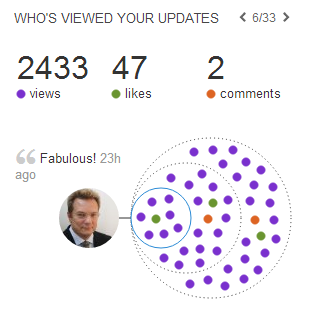 What this shows us is that my update was seen by more people I am not connected on LinkedIn than those I am connected to. The same goes for the Likes and the Comments actually. The size of your network and the quality of your update will determine how many “eyes” will you get on it. On social networks you actually have to behave quite social. Only if you intend to be successful, that is. The time is the most determining factor for most of people when choosing if to use LinkedIn free or paid accounts. It is a bit like the SEO and PPC. If you want to get instant results the paid account is the best for you. If you have been using LinkedIn for years, and have thousands of very targeted people you are connected to you will most likely get away without paying for your LinkedIn account. Whatever way you decide to use LinkedIn, I can tell you only one thing: LinkedIn is a great tool for recruitment! Previous Previous post: Enterprise Ireland must think it has a jobs board?